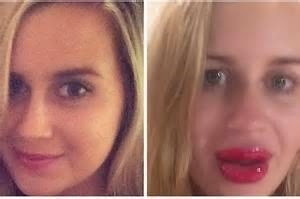 Welcome to The Prophetic Voice OF Yahushua Ministry Blog: These teen girls pumping the lips like kylie cardidasan and there lips are getting burse. There was time no one wanted plump lips like black woman cause they did not want to look like us pretty black girls. Now every one wants the Pretty Plump Black Girls lips at any cost WHATTTT.. The world is becoming insane Yahweh help us. This is not a racist statement aim just telling the truth all color come from the lord through the blacks first we was here first Glory to God. These teen girls pumping the lips like kylie cardidasan and there lips are getting burse. There was time no one wanted plump lips like black woman cause they did not want to look like us pretty black girls. Now every one wants the Pretty Plump Black Girls lips at any cost WHATTTT.. The world is becoming insane Yahweh help us. This is not a racist statement aim just telling the truth all color come from the lord through the blacks first we was here first Glory to God.